Thick injected HR foam surrounding the powdered coated steel frame feels exquisite. 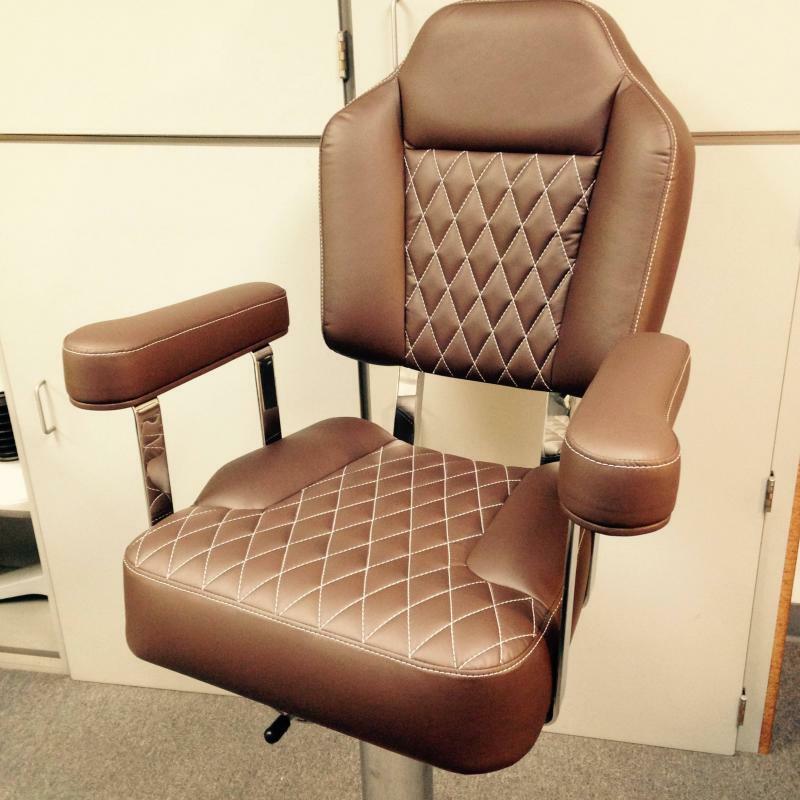 Like every helm seat we make this chair is made with comfort in mind. 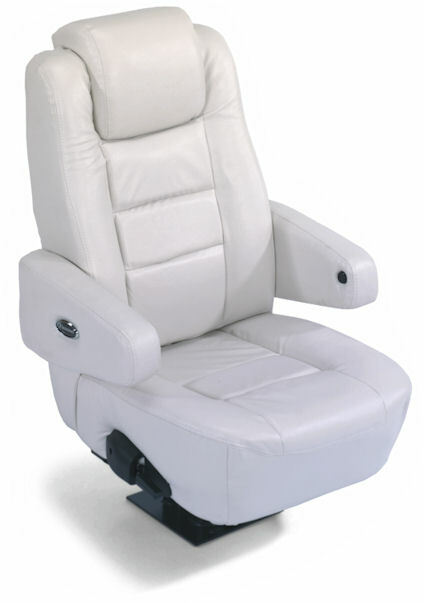 The 8” seat and back cushioning lets you rest and relax while being the captain. 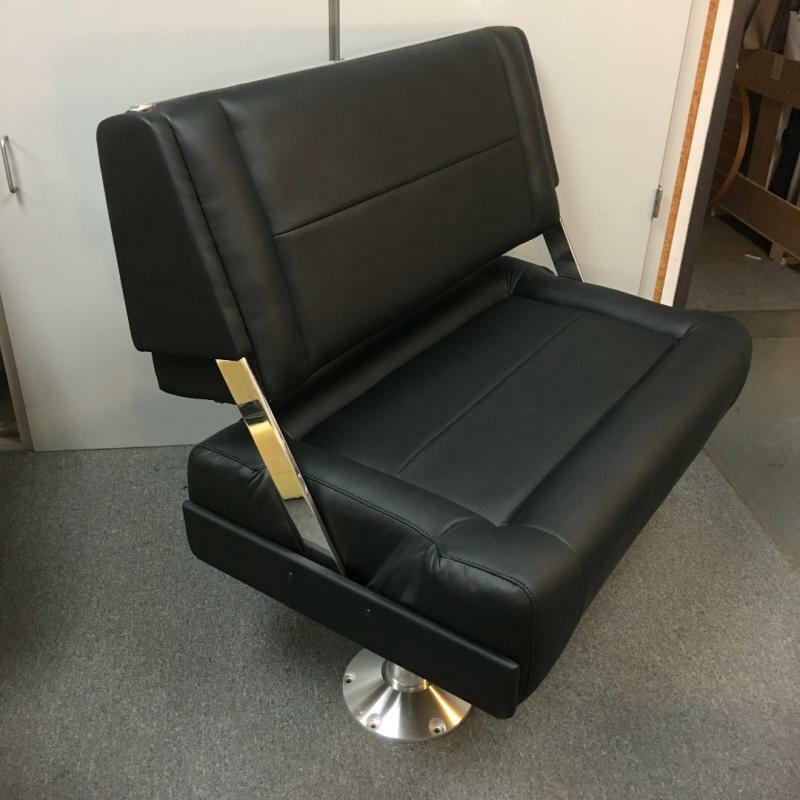 Navigator has a 40 degree reclining back and an adjustable head rest and fold up armrests make operating this chair with one lever pull very easy and enjoyable. 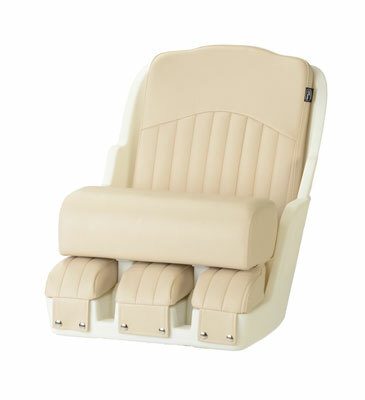 Outside dimentions : 32" high 25.5" deep 21.5" wide Inside dimentions : 18" wide 19" deep 25" high without headrest. With slope type slide rail﻿. 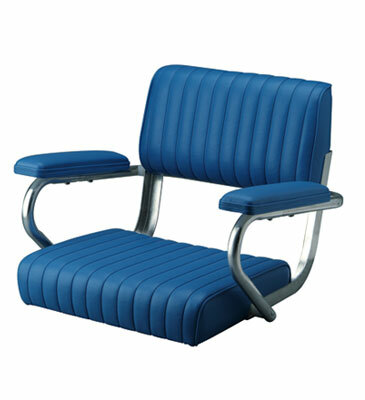 The chair can move front and back or left and right from 0 to 300cm at the slide rail. The length of the slide rail also can be made according to customer’s requirement. 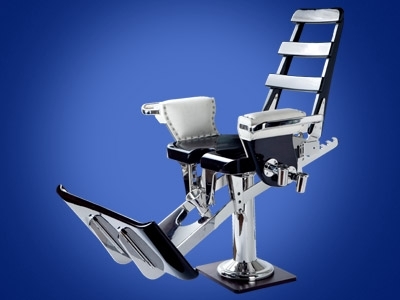 The chair can rise and fall from 0 to 15cm by air operated, or from 0 to 15cm by hydraulic pressure, or from 0 to 30cm by electric operated, or from 0 to 8cm by mechanical operated. 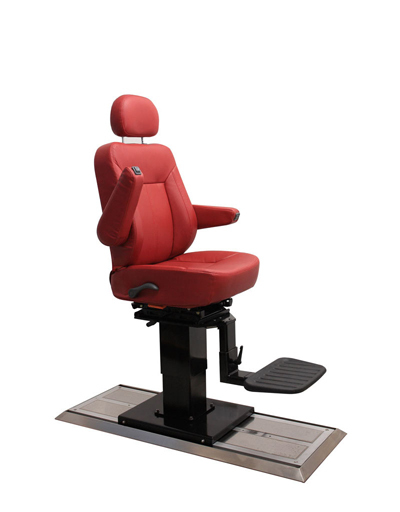 The chair can be 360degree rotation, 12 points positioning control. 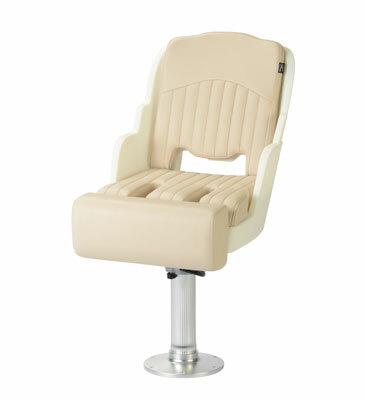 The top of the chair can move front and back by 15cm above the pedestal. 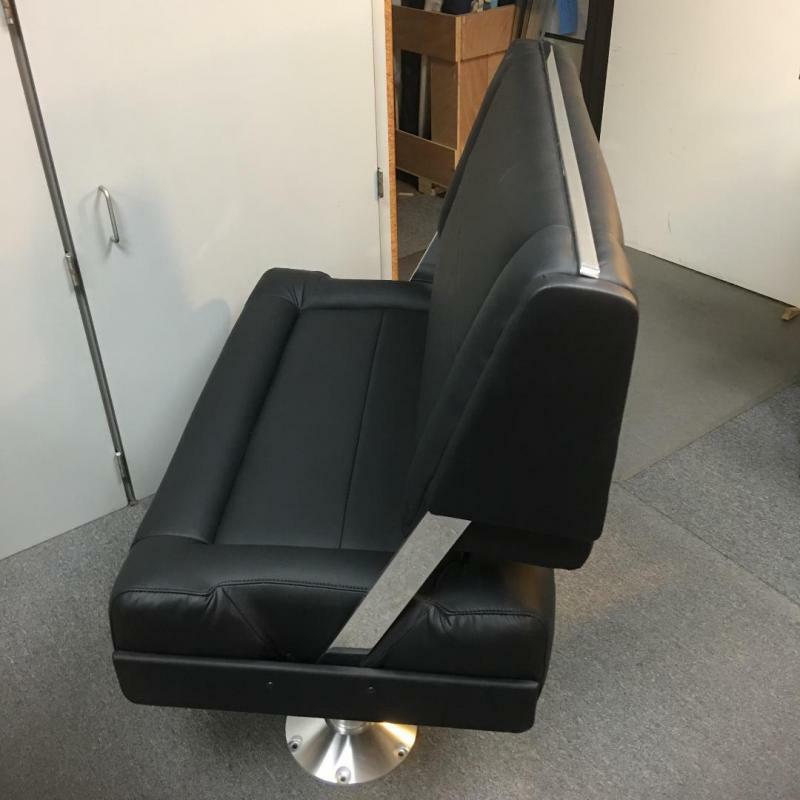 The chair can be bend forward adjustment. 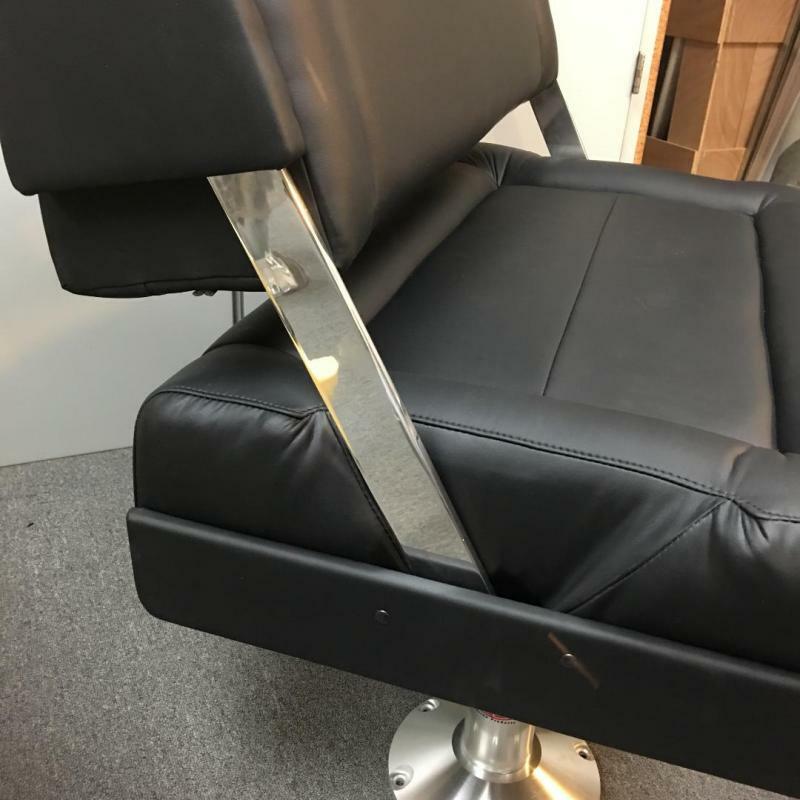 The backrest can adjust the angle from 80 to 150 degrees. 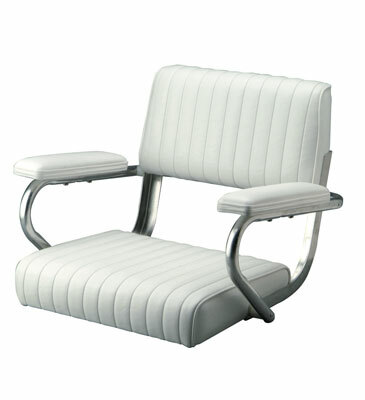 The arms of the chair can have the angle adjustment by multi points. 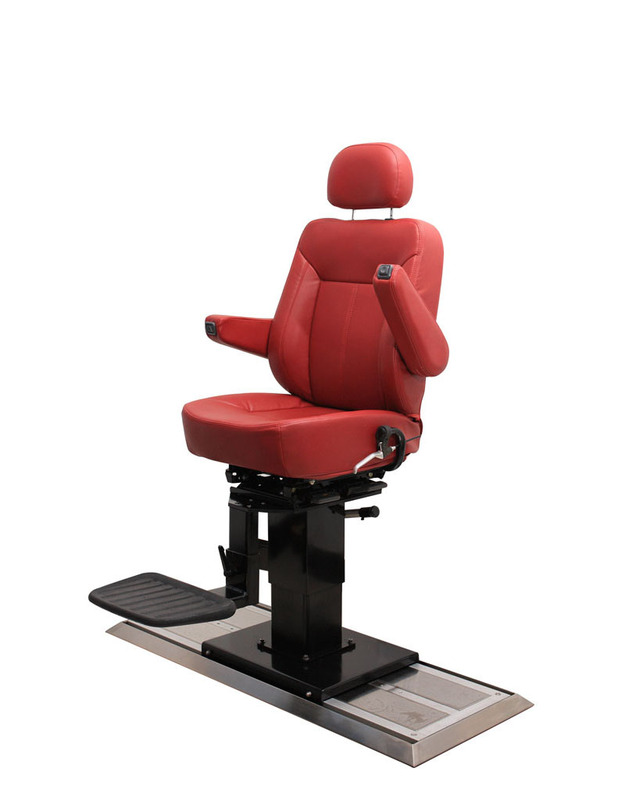 The pedal can upward circle at 90 degrees, and 0-5cm lifting adjustment. 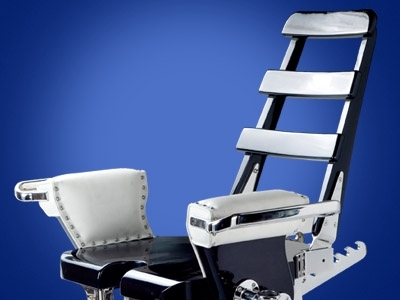 The chair can bear the torsional force more than150FT.LB, reach the international standard. 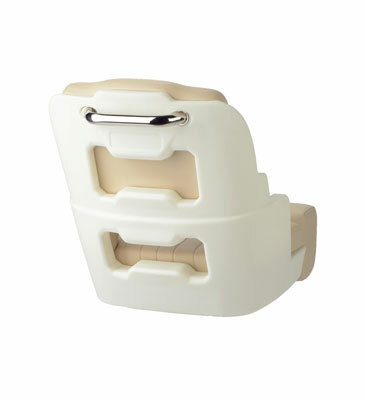 The material of the slide rail is aluminum alloy, outer frame is stainless steel. The moving and lifting parts are made of aluminum alloy, or stainless steel, or steel. Non-skid finish on footrest. 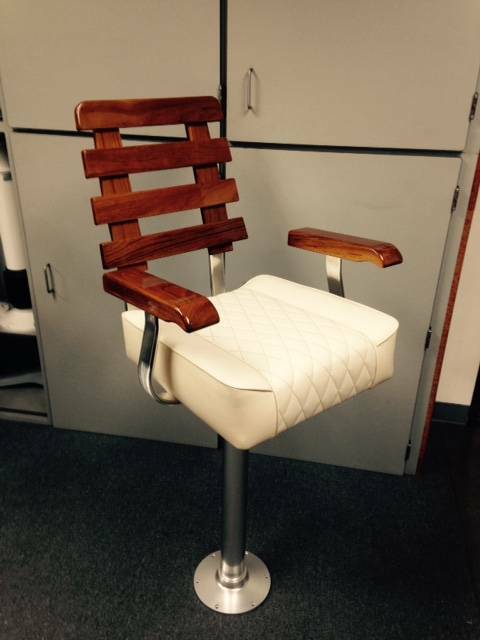 This Chair Is avaible in Other Colors and Also In Solid Teak. 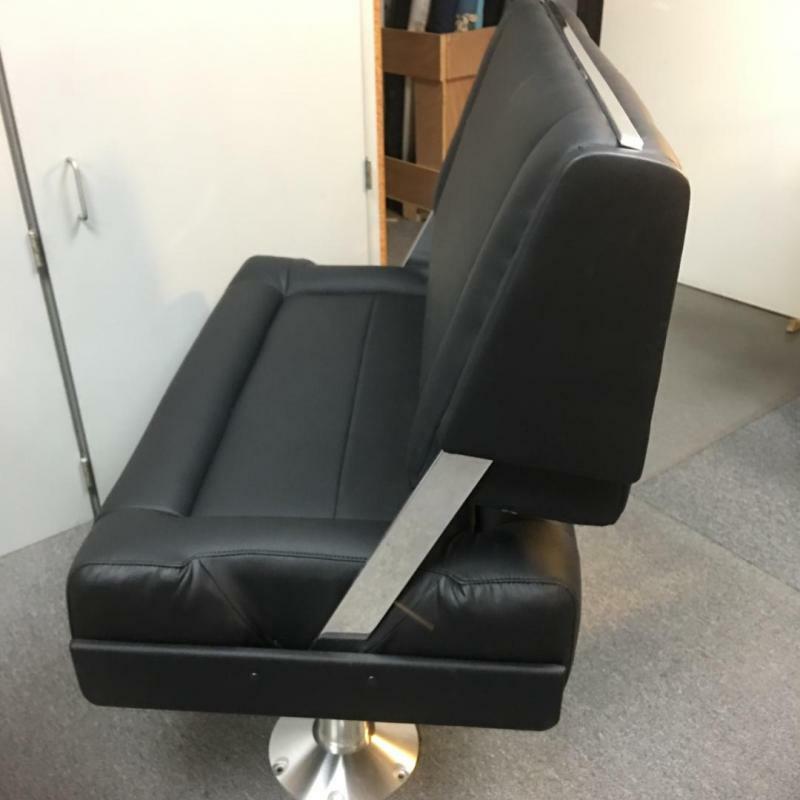 The ultimate comfort was in mind when making this Helm Chair so we Made everything top of line with Removable All solid construction seat, back and armrests Cushions made with Memory foam. 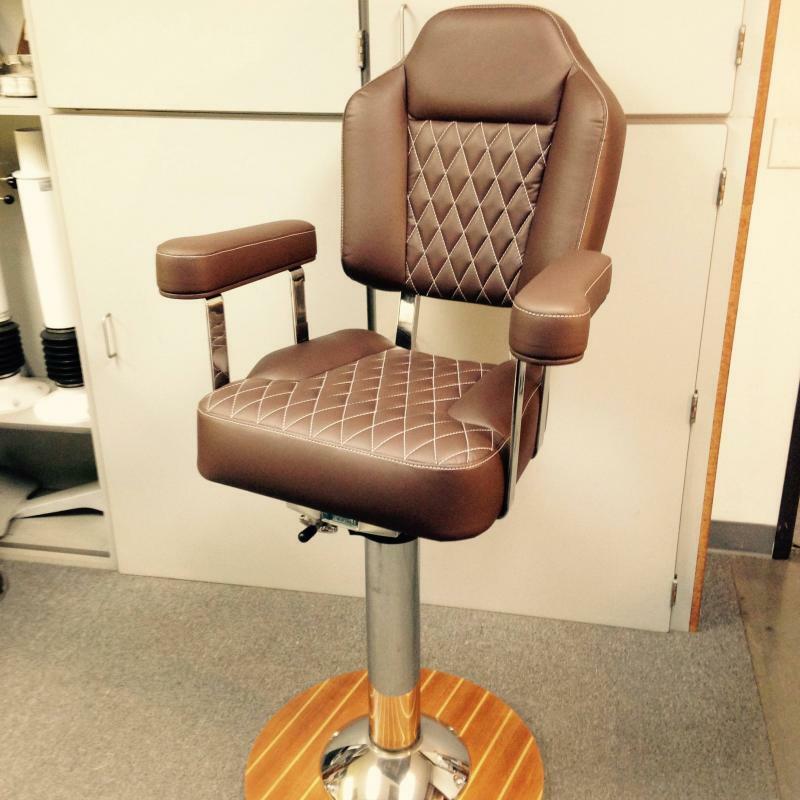 This Helm Seat is made to order in the size you require, Custom wood and finishes available. Solid Teak Heavy Duty Construction 6 Coats of UV Varnish, Anodized Aluminum Bracket. 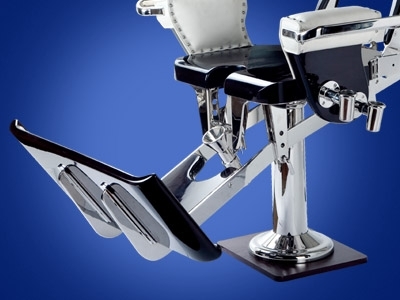 Also Avaialbe in Mirror polished solid stainless steel Brackets. 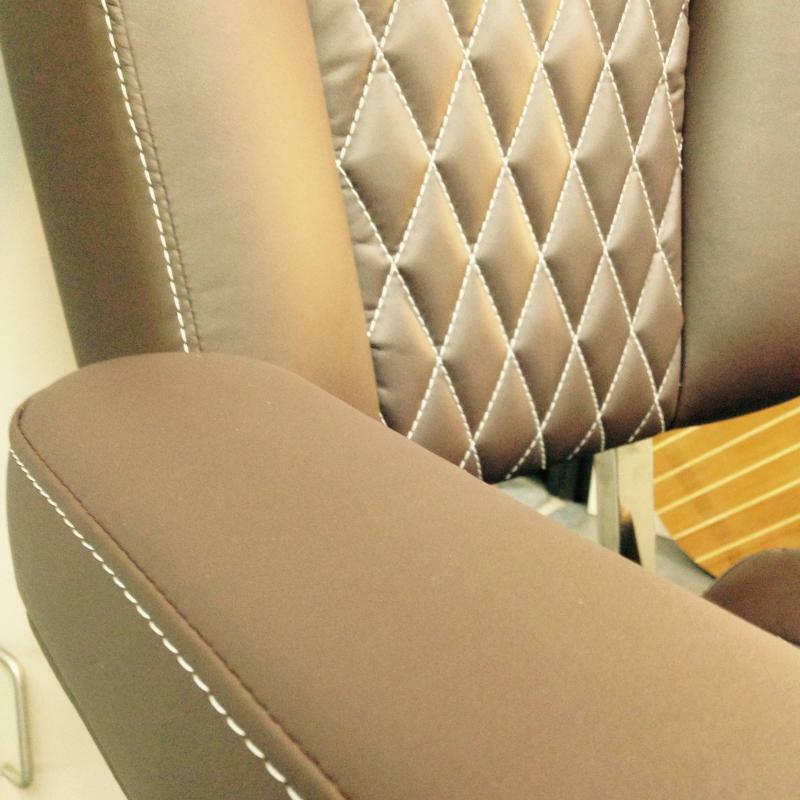 Solid seat Cushion Construction for Greart Comfort. 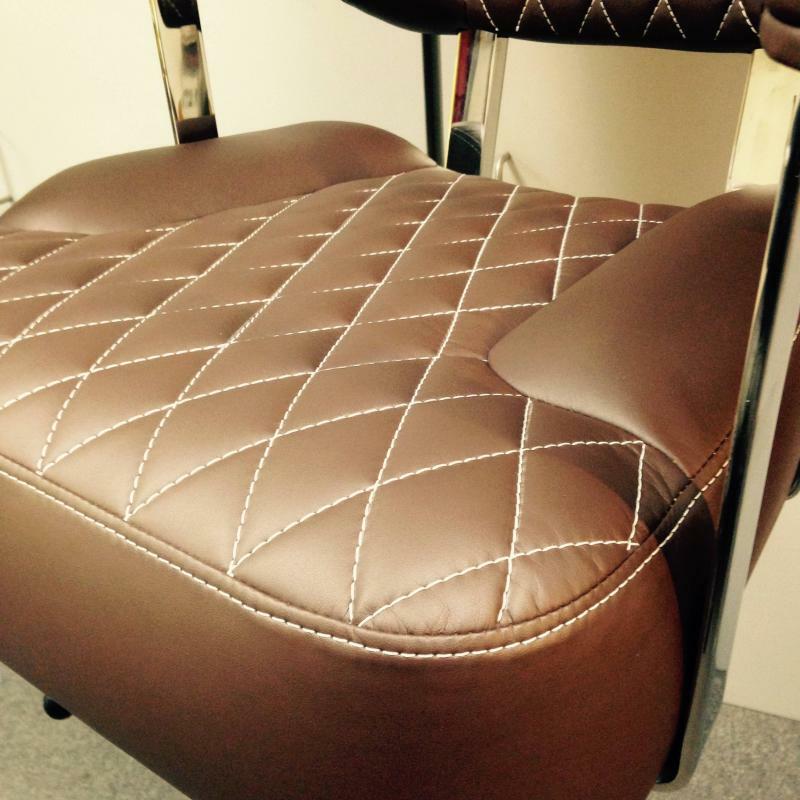 Removable Backrest cushion. Ergonamically Correct Packrest Angle. Options : Armrests can be Padded. 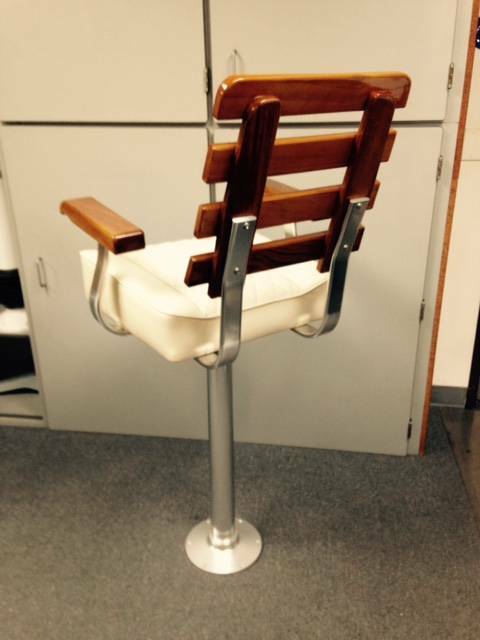 Chair Top only $1,950 with Gloss Finish. $1,750 with Teak Oil Finish. 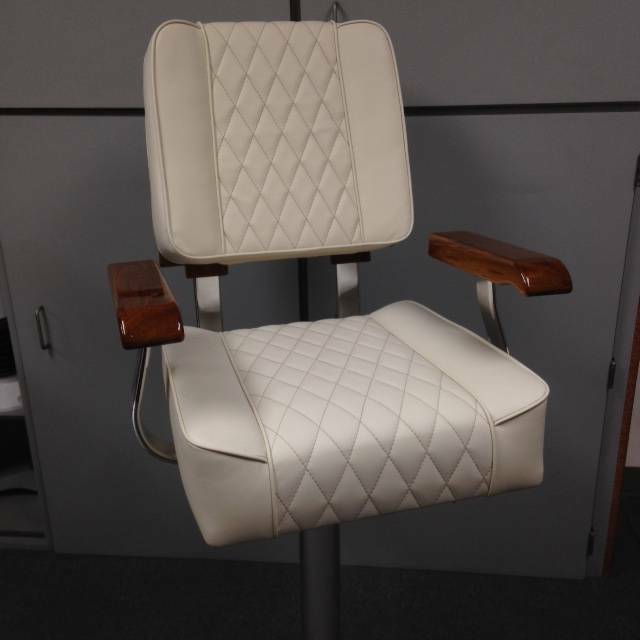 Designed to be different from all other helm chairs. 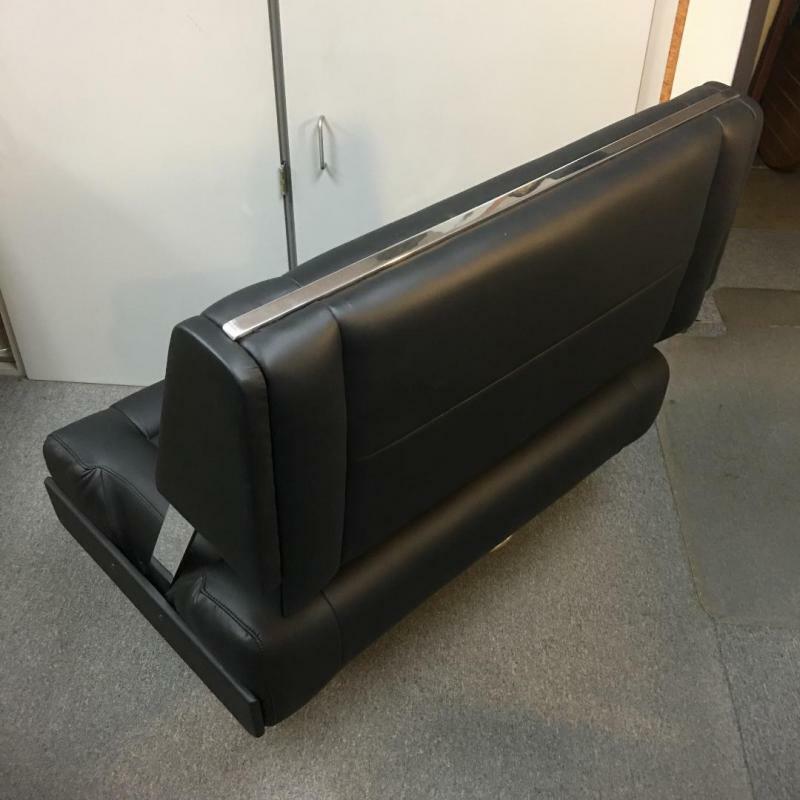 Very comfortable lined back curvature frame with 8” seat cushions. Nickel paled frame with all stainless steel hardware. 26"Wide 26"Deep 23" High. Seat is 20" Deep by 19" Wide. 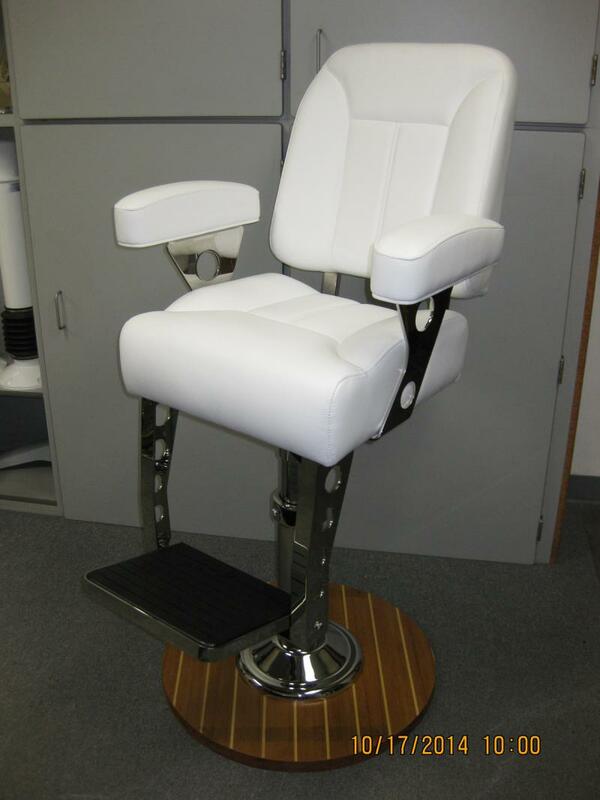 Slider, Pedestal and Footrest Sold separatley. SwingBack Helm Seat Made to Order in Size and Details. 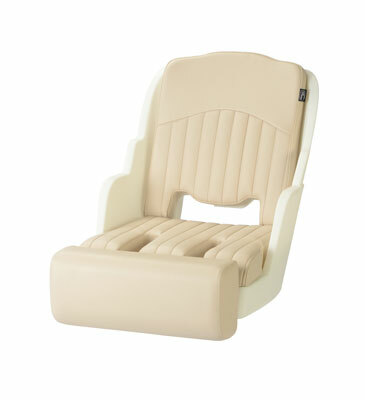 We can Make Our H-90 SwingBack Helm Seat in Any Width, Depth or Height. Solid Construction Frame with HR Foam. 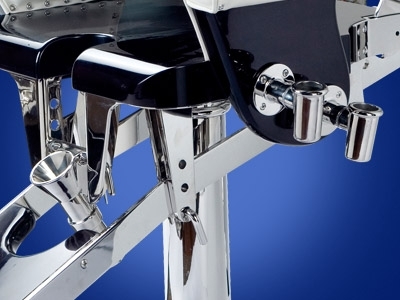 Bright Chromed Aluminum Swing Bracket and Top Backrest Trim. 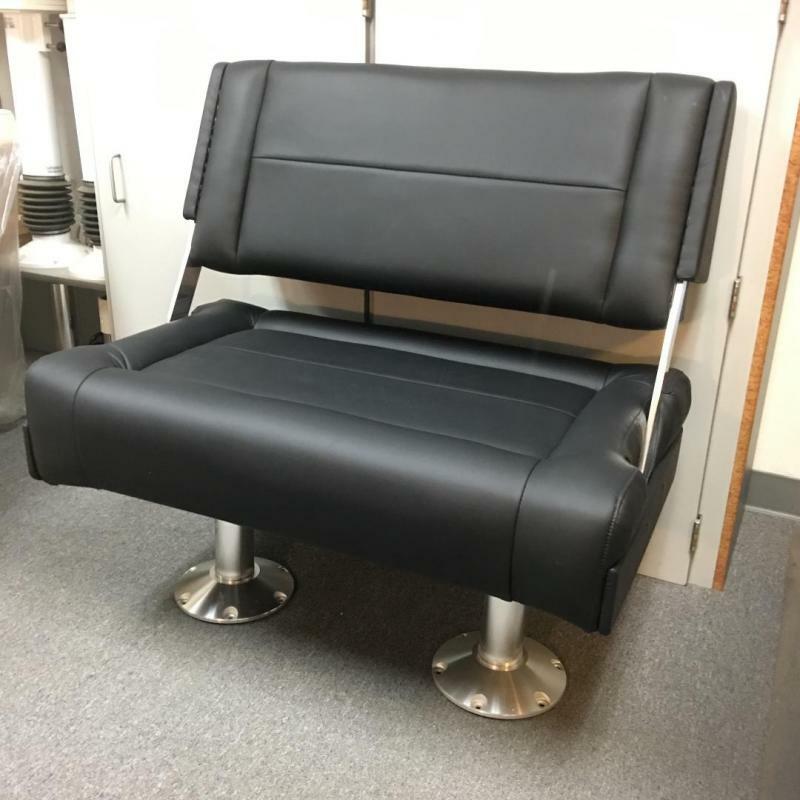 Features : A versatile seat with arm chair comfort Firm resilient foam, marine grade vinyl, durable treated plywood substrates, polished aluminum frame, padded armrests. 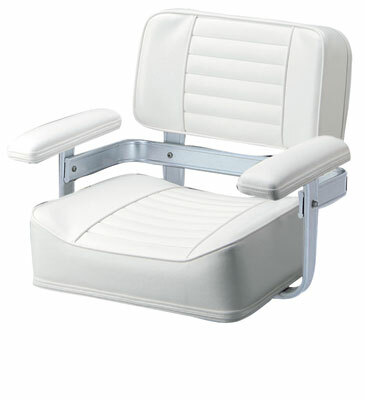 Molded seamless white vinyl cushions, firm resilient foam, welded and bolted anodized aluminum extrusion back and arm supports, durable treated plywood substrates and padded armrests. 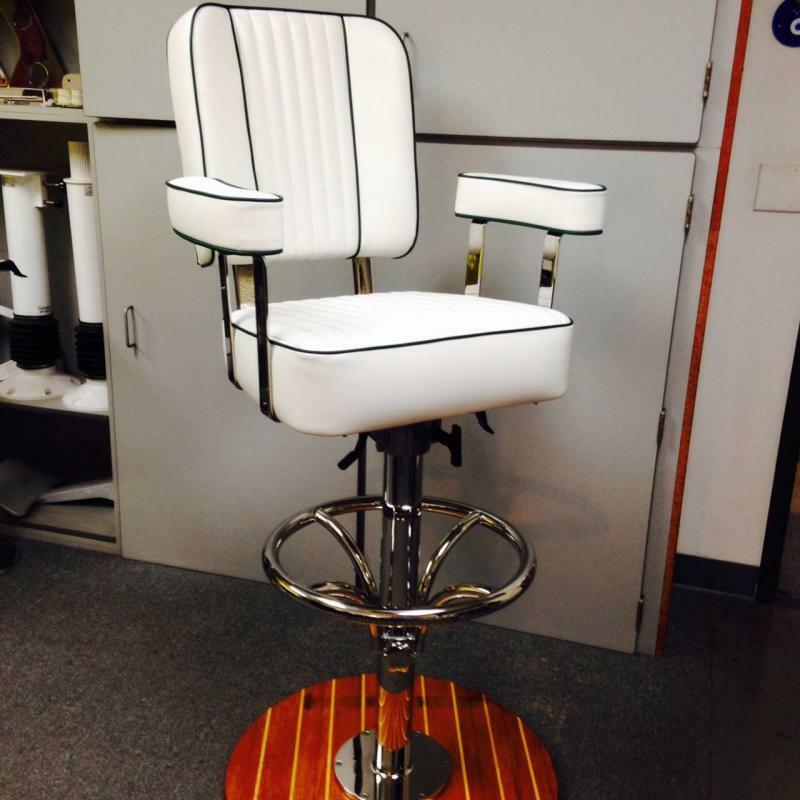 Double Wide Helm Chairs Are Made to Your Ordered Size and Dimensions. 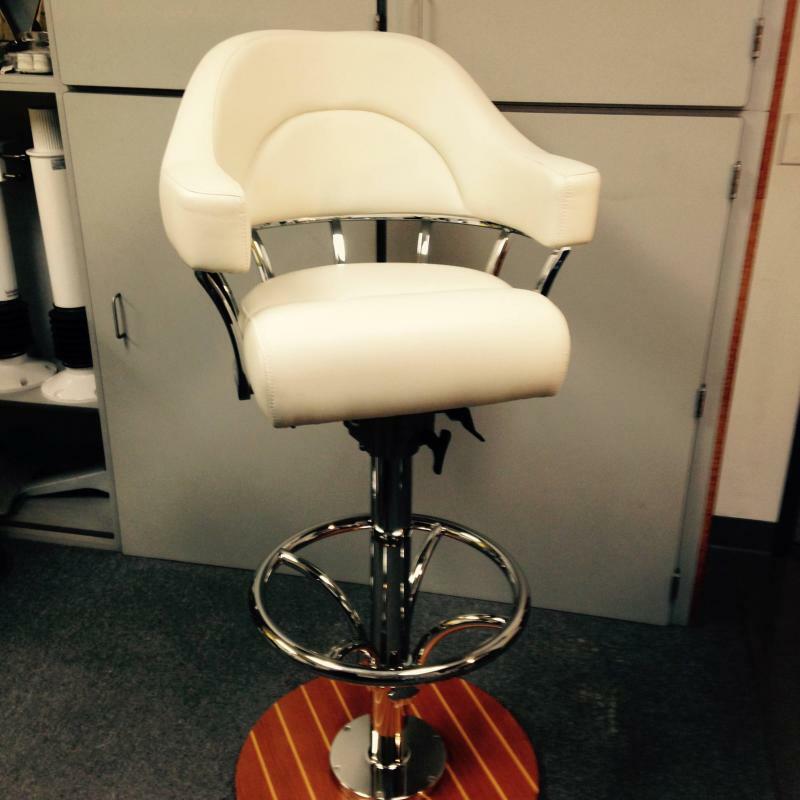 We Are Able to Customize Your Double Wide Helm Chair As Much As You Like.